Education in 2018 is about facilitating the student to become a lifelong learner. Knowing how to learn to adapt to the challenges of new technology and having agility to adapt are becoming key attributes in education as we move towards an inflection point in technology with the rapid advancement of AI and robotics. With this rise, there has been a lot of coverage in the media recently about robots taking jobs away from humankind (think Blade Runner 2049) and this has led to an interesting debate on how education can play a vital role in helping to prepare people to be resilient and able to adapt to the technological advances that will eventually impact their everyday lives. 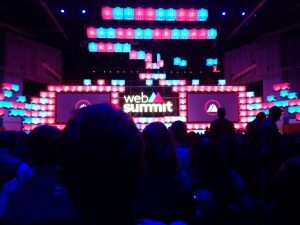 The technology conference Web Summit 2017 was held on November 7th to 9th in Lisbon. I was fortunate to be invited to the Opening Night on November 6th where I heard Bryan Johnson of Kernel, Stephen Hawking and the European Commission’s Margrethe Vestager, talk about a diverse range of topics: hacking into the human brain; ethics and responsibility in the development of AI and robotics; and competition law, how it works to drive innovation by protecting SMEs from the data controlling giants of the technology sector and allowing smaller businesses to compete for business. My personal focus at the event was on learning both inside and outside the classroom. 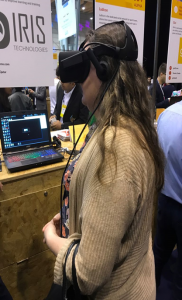 I visited VR, AI and AR alpha stands where I met and chatted with numerous Start Ups. Virtu Oso (co-founded by Scottish vets Rory Shearer and William Seymour) is using AR and 4D video to develop bespoke hardware and software for use in education. ZREALITY (founded by Geman Kai Utzinger) has developed “VR Timetravel” a VR sightseeing experience in Luxembourg into the year 1867. Many others that I met are ideating and developing software and hardware to enhance learning in a virtual world. I also attended many talks and presentations on VR, AI and AR and discovered how this rapidly advancing technology can be used to make learning and information more engaging and dynamic. Ambarish Mitra of Blippar spoke on the Creatiff Stage about AR and how it can be indistinguishable from magic. He showcased the launch of his new product the AR City App. The app helps you navigate and explore 300 cities worldwide using augmented reality and computer vision at scale. Another talk which took place on the Future Societies Stage “Learning Inside and Outside the Classroom” was particularly insightful and relevant to my business, online and distance learning course provider Kilroy’s College. The talk was hosted by FRANCE 24’s Marjorie Paillon and with a panel of expert educators: Duolingo’s Gina Gotthilf, Coursera’s Jeff Maggioncalda, UNESCO’s Mmantsetsa Marope and University of Sydney’s Michael Spence. This panel took the premise that we are living longer and travelling further and that many of today’s jobs didn’t exist a decade ago or have moved in directions unimaginable to our younger selves. They shared their thoughts on the response of educative institutions and technology to our need for lifelong learning in the face of this massive technological shift. Education now needs to produce specialists in specific areas – trans-disciplinarians who can apply multiple knowledge, as well as being a specialist in a certain field. They should be multi-literate and not just adept at the traditional three R’s (reading, writing and arithmetic). They are health literate, they understand the interaction of data, knowledge and skills and they are tech savvy with a desire for good. 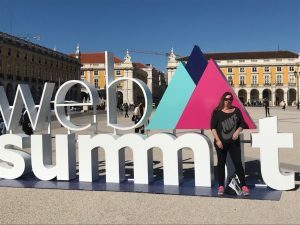 Lisa in Lisbon – blown away by the Web Summit! To be able to solve world problems – not just to give students internships but to give them a real, strategic problem in an organisation to solve to develop core intellectual skillsIn this way learners will be set up to be more resilient in the face of the vast technological changes that are already impacting the workplace on a regular basis. Educators need to be facilitators and use technology to enhance skills learned inside the classroom. A good example of how this works is by utilising a language learning app in the classroom. Teachers can work with the app and figure out what skills are needed and then curate and direct the learning for their students. The virtual world can work effectively with a physical environment. It offers flexibility as well as open access and smart providers are thinking more effectively about how they can work together with blended content. It is not either or – education should be able to call upon multiple resources and media to use them as required both inside and outside the classroom. The future of education is a hybrid that learners will demand. For example, by blending the delivery of a new language the student and educator can keep this activity going all week long and the learner can continue to practice using online resources. We are now seeing more Master degree programmes in innovation and entrepreneurship being offered at university. Education needs to blend this rapidly changing knowledge and to continue to provide institutions that can adapt as and when needed. There are some jobs that do not even exist when a student enters College or school, but if the students gets a good foundation to cope and is agile enough to pivot they will be equipped with the necessary skill set to adapt when they graduate. The take home message for me from Web Summit 2017 is that we should not try to leverage or master technology at any cost. Each of us must take the responsibility of the ethical use of technology on our own shoulders and ensure that this brave new world is a welcoming place for our children to live, learn, work and thrive in. Join our happy community of lifelong learners today and help to future proof yourself for tomorrow’s world.